Last week a scientific paper appeared that reported that eating genetically modified (GM) corn causes cancer in rats. Specifically, the scientists fed Roundup Ready® corn, or maize, to rats for two years, and reported that both females and males developed cancer and died at higher rates than controls. This is very surprising. If GM corn causes cancer, why aren't Americans "dropping like flies," as one scientist asked? We've been eating Monsanto's Roundup Ready® corn for over a decade, even if most of us aren't aware of it. But our rates of cancer haven't increased more than Europeans, who eat far less GM corn. Maybe the effect is limited to rats - in which case we should also have seen dramatic increases in cancer in lab rats. But we haven't seen that either. So what's wrong? The best way to find out is to read the paper, which I did. It turns out to be a very badly designed study, and the report itself omits many crucial details that may (and probably do) completely invalidate the findings. The scientists leading the study have a strongly biases agenda and a conflict of interest, which they failed to reveal. I'll explain below, but meanwhile this study has already been taken up by politicians as proof (proof!) that GMO crops are harmful. As Forbes blogger Tim Worstall explained, this paper is more politics than science. Non-GM corn comprising 33% of the diet (this was the control group). Roundup Ready corn comprising 11%, 22%, or 33% of the food. Roundup Ready corn that had been treated with Roundup during cultivation. 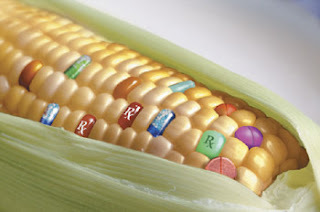 Non-GM corn but with Roundup itself added to the rats' water. So what happened? Well, in some groups, the rats got more cancer than controls. But not always. In fact, the authors had to cherry-pick their own data to support their conclusions. "The type of statistical analysis they used is really a type of fishing expedition. One individual referred to it as 'fantasy statistics.' "
Another major problem is that there's no dosage effect. In other words, if Seralini is right and GM food is bad for you, then more of it should be worse. But the study's results actually contradict this hypothesis: rats fed the highest levels of GM corn lived longer than rats fed the lowest level. A third problem, as Discovery News and other sources reported, is that the rats used in this study are a special laboratory strain that is highly prone to cancer. Perhaps most damning, though, is the fact that rats fed Roundup directly had the longest survival times. As Seralini's own Figure 1 shows, the longest-living rats in the entire study, out of all the conditions, where those that drank Roundup in their water. These rats outlived the control rats. Yum! Maybe Perrier should start selling Roundup-enhanced spring water? "Interestingly, in the groups of animals fed with the NK603 [Roundup Ready corn] without R[oundup] application, similar effects with respect to enhanced tumor incidence and mortality rates were observed." This tortured English is their way of admitting that rats did worse ("similar effects") when fed GM corn that was grown without Roundup. They don't want to admit that this result contradicts their central hypothesis. The study was designed to fail: the sample sizes (10 rats in each group) are so small that all the results are likely just due to chance, and none of the differences are meaningful. It's exceedingly unlikely that the Roundup in the rats' water made them live longer, just as it's unlikely that Roundup Ready corn had any effect on the incidence of cancer. I know that ad hominem attacks aren't valid, but I can't resist pointing out that Seralini's co-author, Joel de Vendomois, is a homeopath, with a "Homeopathy and Acupuncture Diploma", a double dose of quackery in a single degree. Seralini has also published a book about the supposed dangers of GMOs, and he and de Vendomois are the lead scientists at CRIIGEN, an organization devoted to lobbying against GMOs. Of course, even if Seralini and de Vendomois are bad scientists, and even if they have a strong bias, their paper isn't necessarily wrong. It's wrong simply because the science is wrong. Not surprisingly, an anti-GMO group in California has gleefully embraced the claims of this dreadful paper to argue in favor of Proposition 37, a ballot initiative that will require labelling of genetically modified foods. And Jose Bove of the European Parliament has used it to claim that all GM crops are harmful to human health. Let's be clear about the science here. Genetic modification of foods is a powerful technology that can be incredibly beneficial. The recent development of salmon that can grow faster is an example: these salmon (developed by a company called AquaBounty) will make fish farming more efficient, and thereby help preserve the perilously endangered wild fish species in our oceans. On the other hand, GM technology can be used, as Monsanto has done, simply to allow farmers to use more pesticides, which doesn't seem to benefit anyone other than the pesticide producers. It's unfortunate that Monsanto's behavior has been used as an excuse to give all GMOs a bad name. Now we have a bad study done by anti-GMO scientists who have allowed their political agenda to trump their scientific judgment. What a mess. I know, but it's even harder to reason with anti-GMO folks than it is with the anti-vaccination crowd -- any attempt to point out flaws in such studies results in accusations of being a corporate shill. And your prediction is borne out by the comments over on my Forbes blog. Great post. I have to take issue with your statement that roundup ready GMOs "simply...allow farmers to use more pesticides, which doesn't seem to benefit anyone other than the pesticide producers." If being able to use more pesticides weren't benefiting farmers, they would buy different seeds or save from previous crops. You can argue that the convenience for farmers and resulting monetary savings for consumers isn't worth the environmental cost of increased pesticide use, permitted by monsanto's GMOs, but there are beneficiaries outside of the pesticide industry. Roundup is an herbicide, if that makes any difference. The link to the full report, in the article above, does not load. I noticed this yesterday, and it still will not load. It gives a message that the .pdf file "is damaged and cannot be repaired"
This COULD be because someone has quietly withdrawn the report, OR it could be due to Monsanto-affiliated hackers' sabotage efforts. I rather expect the latter, as no one on the Reich is trumpeting the "fact" that the authors seem to have withdrawn the study's results, as they would if the link they keep posing HAD been withdrawn by the authors. No, it seems undercover at this point, as if the hackers are simply hoping no one will persist in searching the data out. The link still seems to work - you should try again. But I should add that I don't know that the organization displaying it has rights to give out that PDF file for free, so they might be asked by the journal to take it down. There's no way that this is "sabotage." Sorry. Nice to see you adding to the chorus of “thumbs down” on this awful study. Sadly, that won’t stop its being cited far and wide in the crankosphere. "On the other hand, GM technology can be used, as Monsanto has done, simply to allow farmers to use more pesticides, which doesn't seem to benefit anyone other than the pesticide producers. It's unfortunate that Monsanto's behavior has been used as an excuse to give all GMOs a bad name." This isn't entirely true. I realize that Monsanto has a bad name, and I'm sure I cannot change your mind. However, the use of glyphosate and the Roundup Ready technology benefits everyone. When Roundup went off-patent years ago, prices of the herbicide declined as well (cheaper inputs for producers). Being able to use glyphosate in-crop means that producers can avoid using other herbicides to do the same job. This very important because glyphosate is relatively harmless compared to most other pesticides. As a general rule, herbicides which inhibit plant-only metabolic processes are safe(r) on humans. Since we do not have the EPSPS enzyme, glyphosate has a very low chance of binding to anything in human systems. This protects professional applicators and producers. Likewise, the Bt technology has actually reduced the amount of pesticides being sprayed for insect control. Producers were, at one time, spraying crops with insecticide up to 6 times per growing season. Now that the plant has the gene, no applications are necessary because the Bt gene is controlling the insects. This also means that a producer is using less fuel, which benefits everyone. As a graduate student in agronomy, it is very frustrating for me to see the anti-GMO groups scaring unknowing consumers out of their wits. There is so much bad information online, one can hardly blame consumers for being scared when these people are telling them that we are trying to give them cancer and birth defects. Thank you for helping to spread awareness about this mis-information. Ok, so in all honesty I am fairly anti-gmo, and have only just begun my diploma of agronomy, but with my husband being a farm hand, and having connections in the department of primary industry I have already come across conflicting evidence that has made me question if I want to continue my studies. My concerns aren't so much wether the gmo itself causes cancer, but more on the other impacts people aren't taking into consideration. Attending meetings between farmers and agronomists I've learnt glyphosate doesn't actually disperse from the soil as we thought. It's binding to minerals and leaving them unavailable to the crop. Isn't it concerning? Couldn't we be heading down the path of unsustainable farming practice as we did plowing? How many acres of cultivation are going to be left non arable? I can see it now "zero till, zero glyphosate". Then there's the fact that GMOs are ment to reduce the amount of chemicals sprayed. When infact, farmers are advised to spray two rounds of round up with another stronger (more harmful, more costly) chemical between to combat the occurrence of round up resistant "super weeds". The occurrence of this resistance is directly attributed to the increased use of round up thanks to round up ready seeds. It's already a huge issue in Australia, and GMOs are far less prevalent. Then there's the gm cotton, that's ment to completely stop the need to spray, but since we've stopped spraying the grub, other insects are becoming an issue and needing to be sprayed. What about the social issues? Poorer countries that usually have the fallback of saving seeds for next year's planting are reporting increased suicides because Monsanto's seeds were way more expensive, but offer no guarantee of viability. When these crops fail, they can't stash seeds for next year, because that's stealing technology. What about consumer choice? Organic Crops are being contaminated, and an entire nation (so far) has completely lost its right to choose non gm foods. The point of world hunger, well, in developed nation's people are still going hungry. Are the increased yields really contributing to wiping out world hunger, or are they just contributing to food waste? I'm really interested to hear any thoughts you have. P.s. I'm disturbed by the suggestion that drinking round up could prevent cancer, I guess it goes to show that both sides can manipulate reports. Why don't you have your loved ones exposed to this poison on the regular and then see how smug you can be on this issue. If GMO is not dangerous, why not label it? I am from Europe. Veggies and fruits there have a nice aroma and taste. Here there is no aroma, no taste, unless you buy it from a local producer. I do not need to be a scientist to realize that something is wrong with this manipulation and I am so fed up with science trying to tell us what is right for us. Science has its place and space, but I am not in favor of a company modifying what I eat and then not allow me the freedom of choice. My personal friend in Washington D.C. ten years ago' did an experiment with rats eating GMO and 50% of rats developed cancer. You may be skeptical of any study, but if even one rat got cancer I want to know why. There is no coincidence. There is only figure out why. You're right that tomatoes here are tasteless - they've been bred to be bright red and rock hard when picked, but they bred out the flavor. This has nothing to do with GMO - you could label all those tasteless tomatoes as "non-GMO", which wouldn't do us any good. An anecdote about your friend doing a study is, I'm afraid, only an anecdote. It has no scientific validity. I can say I have a friend who did a study with rats eating non-GMO foods and they got cancer. Does this mean that non-GMO foods cause cancer? No.